Ieshia J. Dunmore is an Associate Attorney with The Cromeens Law Firm, PLLC, where she focuses on practicing construction, business and real estate law. Within these practices, she handles a multitude of contract disputes and reviews on an on-going basis to ensure compliance. 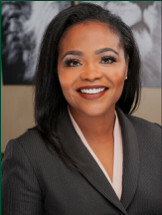 Prior to joining the firm, Ieshia served as Sole Practitioner for six years in San Antonio Texas, where she managed multiple cases simultaneously as a trial litigator. She provided counsel in the areas of Personal Injury and Family Law. She earned her B.A. in Political Science with a minor in Public Speaking from the University of Texas at San Antonio in 2008, and her J.D. from St. Mary's University School of Law in 2012.